You will find some great suggestions I found on the web. Be sure to see the pictures of gummed up locks at the end. It will give you a better idea of what you might be dealing with in your own case. READ THIS FIRST. This is advice from one of the TOP locksmiths in the country! "Advise them to spray a small amount of DRY lock lubricant onto the key blade and move the key in and out of the lock several times. People may spray too much lubricant directly into the lock and actually block the key from fully entering. Lubrication can extend the life of the lock and promote easier operation. Might be good advice for every customer. Liquid sprays like WD40 tend to attract dust and make the situation even worse"
1. If you have a sliding door over the lock face, make sure is it fully out of the way so you are able to insert the key properly. Sometimes the cover sticks in place and won't let you in until you wiggle it out of the way. 2. Does the key fit in the lock properly? If so, that tells us it is the correct keyway. When inserted does it just not turn? Double check the number. Recently a customer could not get the CH516 key for his lock to work. He returned it to me and I tried everything I could think of. As a last resort I started taking every CH series key I have and tried them in the lock. The one that worked was a CH518. When I looked at the stamping on the lock, what was supposed to have been an 8 did’t get stamped on properly and was on an angle. It made it look exactly like CH516! 3. If number 2 is true then it might mean that the wafers inside the lock are stuck in place. They can get this way if the lock has been exposed to weather. First spray the key with a good lubricant (preferably not WD40 as it has very little lube and causes dirt to stick) and insert it in and out and do this a second time. Then see if you can get the key to move slightly. If not, get more aggressive and spray more lubricant (a graphite is good) directly in the lock so that it flushes out some of the gunk (some people have used brake cleaner with success) Let sit over night if possible. If you are noticing that the key is moving more and more each time that's a good sign. A friend of mine removes the whole T Handle and soaks it in water and claims this works better than anything. There are a number of things that can occur to cripple your lock. Using lock de-icer leaves a residue that actually eats away the brass. The brass wafers inside (min 4-6) can corrode and have chunks of that green looking stuff growing on it. When the lock is exposed to weather all the time not only the corrosion starts to build, the dirt from the outside begins to adhere also. Look below at the pictures- especially Figure 1. You see the brass wafers and the tiny springs that hold them in. You can have corrosion or dirt built up in the gate or whole that the key slips through. This can change the height of the hole and push the wafer higher than it should be when the key is inserted. The springs may not have moved for a long time and are bound in place. This is where a sharp rap can help. 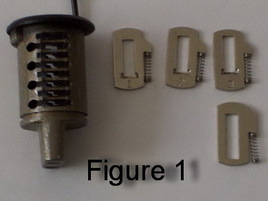 It only takes one wafer stuck or disfigured due to dirt/corrosion, to keep the lock from opening. A word of warning- don’t try and muscle the key and put too much pressure on the key when trying to open. The lock will finally spin around from stripping the outside wafer that is exposed, but it will never unlock again. 4. If 3 fails, get a small hammer and tap gently all around the outside of the lock/handle. Sometimes you can actually hear the ping when the spring that is stuck breaks loose. Sharp raps but not enough to deface or warp the metal. Some people finally had success by tapping on the key itself (gently also). PROBLEMS with THULE, Sears Car Top Carriers, Toyota RAV Roof Racks, CURT LOCKS and other applications using a THULE LOCK. One customer wrote- "I ordered half a dozen-ish keys from you in the past for these racks and sometimes they are a bit tight being new, but I am usually able to give them a little tap on the back and then they move. After the initial opening, they are usually good to go with no hangups. " 1. I already gave one bit of advice on the subject and this is my final bit seeing as there are still people ranting about it. The best to use would be carburator cleaner for the cleaning(will clean alot of the gunk and stuff out) and then use a gun lubrication such as clp(according to the locks climate there are a multitude of CLP's like motor oil). Your really should not use a heavy lubricant on something that requires precise mechanical movements with small parts. As far as cleaning a lock out, Leave it in carburator cleaner/Hydorgenperoxide over night. If a water based lubricant was used previously and you are not in a dry/sandy climate or hot/humid climate WD-40 should be sufficient. As far as im concerned wd-40 is for large non technical mechanical objects I.E. Door hinges and the like. Ive worked in a multitude of climates from dry/cold (St.Paul) to hot/humid (Georgia) to hot/dry (Iraq) and many places inbetween. From Mechanic to Tactical Satelitte Commo and have had to clean locks out for my equiptment boxes and sensitive items. 2e: WHY IS THE WD-40 SO BAD? b. In one of the LSS+ Supplement DVDs an institutional locksmith named Brian Chan recommended that if you use graphite as a lubricant you need to have the lock (or the plug itself that's already loaded with the pins) in your hand and taking a very soft and fine artisan brush thats dipped in graphite, lightly go over the top of the lock (plug) with it. He noted that after dipping the brush in the graphite, tap the brush on a piece of paper to get the excess off. The lock also had to be clean, dry and free of any other type of lubricant by using some solvent to clean it or the graphite will mix with any previous leftover residue and muck up the lock. I've been on many calls where the customer had unloaded an entire tube of graphite they bought at Pep Boys into a lock in an attempt to lubricate it and actually made things a whole lot worse and my job much harder. This is why if a customer asks me what lubricant I would recommend, I tell them to just stick with WD-40 and stay far far far away from graphite from being used on any lock thats exposed to the elements. SoCal area gets too humid for these dry dusty lubes. For institutional locksmiths using graphite might be alright where they may have a little more time to go through all this trouble to apply it properly and with most of the locks inside a closed, dry and cool climate controlled building (or maybe also for a hobbyist) but most locksmiths from a small independent shop don't have the time and luxury to do all this so I think WD-40 is still a better alternative IMO than graphite cos its cheap, easily obtainable and is a pretty good temporary penetrating lube. I personally prefer to use Ballistol if a reach for a lubricant in most cases and CRC Lectra Motive Cleaner when I need a strong solvent and cleaner that won't damage paint jobs like brake cleaner can. c. Using graphite on a cylinder is also a nice way to piss off the next person that has to re-key or work on it. It'll effectively stain their fingers for the rest of that day. d. Myself I agree with the Carb cleaner, because it cleans and then disappears. I do use PB Blaster to get the gunk out of old locks, it works really well, it doesn't seem to have a gumming affect like WD-40 tends to have, but I too am in Oregon, and if we don't use a lubricant of some kind these locks, mainly a Master, will or can rust up really quick, I have actually seen shackles of these locks have so much rust on them that a hammer attack would probably break them into two pieces. e. I learned this many years ago in Auto Shop after growing up believing that WD-40 was like duct tape... As in, it works for just about everything. There are large differences between oils that are supposed to break things down and ones that are supposed to be a long term lubricant. The first is penetrating oil http://en.wikipedia.org/wiki/Penetrating_oil), the second is oil-based lubricant (http://en.wikipedia.org/wiki/Lubricant). If a product is designed to be good at breaking bolts loose or unsticking something that's not moving properly it is a penetrating oil. If for lubrication, well that's self-explanatory. No matter what a company's advertising department says, a product produced for one of these purposes will be almost useless for the other. If a product is designed to be good at both, it won't work very well for either. WD-40 is a penetrating oil... It works great for that. It is not however a lubricant, in fact it will have the opposite effect because of the residue. Please read the links above for an explanation of why. f. I usually use CRC Lectra Motive Cleaner. It looks just like the Barkleen can but it's intended for cleaning electronic components on cars like alternators. And it's much much milder than brake cleaner so it won't destroy paint jobs on front doors, car doors or eat up plastic. Just have a rag in hand to quickly pick up the run off as soon as it comes trickling out to avoid making a mess. I used Lectra Motive cleaner all the time on cars to clean out car locks before decoding to make a key. g. For me the WD-40 is the best out there. I have a silicone based one the Pecol P 90 and I wouldn't dare to use it on a lock. What I know is this: WD40 "attacks" everything that is plastic. While a silicon based don't. But a lock have no plastic on it's mechanisms so, no problem. My opinion: WD-40 is the best to clean, and to lubricate a lock and it is anti rust. It's relatively durable. It has such a spraying pressure that is ideal to a normal lock with all that holes and small mechanisms. h. I have noticed a lot of opinions for and against WD40 and just thought I would add my 2 cents. I have been a mechanic for 20 years and I never use WD40. I find it useless, it does not last very long and seems to collect dust and grime. It appears to be, basically, kerosene in a spray can. I have been using a product called Houdini Lock Lubricant and it seems to work well. i. WD-40 is far better than graphite in a lock. I have worked for the last 7 years in the midwest cleaning out graphite filled locks and looking at worn pins and tumblers caused by graphite. 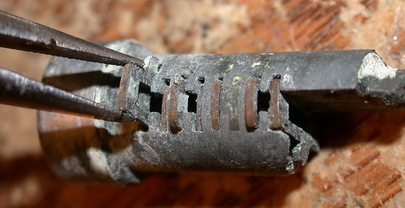 Graphite, when used in excess or when allowed to get wet or dirty will clog a lock. The only thing that seems to clean it is WD-40. Now WD-40 is also a liquid so over doing it just causes a little river to form while over doing any solid based lube will cause parts and chambers to fill. With that said I would rather leave a customer with WD-40 over any dry lube. On my own I use dry lubes in very small amounts but then I am not an idiot. Customers generally are idiots. "If a little is good a bunch is better" is the mentality. j. WD-40, while technically not a lubricant, does have an amount of lubricity to it. WD-40 is made up primarily of kerosene, Stoddard solvent (yup - dry cleaning fluid), and mineral oil. It originally used propane as a propellant, but I think they use something else now. Anyways, the Stoddard solvent was designed to quickly evaporate, leaving a deposit of kerosene (dissolves gums, greases, etc.) and mineral oil. Wiping off the residue usually picked up the grease and grime dissolved by the kerosene. A small amount of mineral oil would be left on the surface to disperse water. Mineral oil is a lubricant (albeit a poor one). The original use for WD-40 was at Rohr Industries and General Dynamics in San Diego to coat the electronics in missile guidance systems. They were having difficulty with condensation forming on the electronics when the missiles were at altitude, and this caused failures in guidance/control. Hence, WD-40 was developed. The people working on the missile systems quickly realized its potential in other areas (e.g. stuck bolts, removing labels, etc. ), and we've still got it today because of this. Anyways, as a lubricant it's not the best for long-term usage. Any liquid lubricant will attract dust, dirt, and grime. Graphite, while having lubricative qualities, is basically dust itself. I won't use it in locks for a variety of reasons mentioned already in this thread. Your best bet is to get a dry lube with a penetrant. So, it goes on in liquid form, but leaves a layer of a dry lubricant on the interior parts. Something like Medeco's Poxylube or the nearly identical Liquid Wrench L5 are good choices. These are polytetrafluoroethylene suspended in fast-evaporating solvents and penetrators. It works extremely well. k. KristopherW wrote: I use powdered graphite to lubricate a lock but I'm wondering if WD40 is the best for cleaning and flushing a dirty lock? It seems most people would not use it to lubricate a lock which I understand but what about cleaning a dirty lock? What if the customer gummed up the lock with graphite or oil or something else? Is WD40 a good way to flush out and clean a lock? WD-40 is a decent cleaner, particularly where the contaminants are oil soluble (lots of gummy contaminants are), but it will leave a residue. 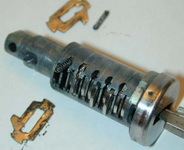 The residue is slight and will probably never matter in a lock that is used regularly, but if you put WD-40 in a lock and leave the lock unused for a few weeks or months the residual WD-40 will form a lacquer and potentially seize up pieces. I'm a rookie at lubricating locks, but I've been a firearms instructor for a long time and seen plenty of firearms gummed up after being 'lubed' with WD-40. 4. Out here in Kuwait we are cutting locks every few months because of people running out there WD-40ing them to open them and then a few weeks later forget there WD-40 they get the key jammed in there and break it off. All of my locks now have littl plastic bags around the key holes and rubber bands around the shackles with the shackle running through the bottom of the bag so you can unzip the bag to access the key, not the best way but it will cut down on some of the drit from getting in the keyholes. 1. Here's a little trick I know that may help you out. I don't know if you are right handed or left handed, but with your left hand, take your index finger and hold the center of the lock, while pulling on the key with your right. Simply put, hold the center of the lock in order to relieve pressure from pulling the key out. Another way to do this is to hold the key between the pads of your index finger and thumb, and kind of roll them until you are holding the key with the tips of your finger and thumb. I know this all sounds kind of funny, but what I suspect is that the locks center piece has become lose. (Wiggles in and out). By holding the center part in place, you actually can remove the key in a case like that. Hope this helps. 2. 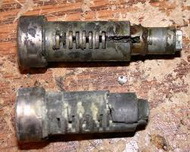 This could be a symptom of worn tumblers inside lock. If so, then it may be time for a lock replacement. If your key is stuck in a lock, turn the key to an upright position; then pull out with one hand while pushing in the small core immediately surrounding the key. If the problem is the key, you must replace your key if the problem persists or if the key does not open the lock. Eventually your key may break off inside of the lock, requiring a lock change. 4. I read and tried the tips posted: hold the center with one hand and pull the key with the other & lubricate with graphite. Neither worked. This lock is a couple of years old, but the interior key got stuck after 6 mos. Since it was inside, I didn't think it mattered. I was cleaning out a drawer and found a key--I tried it in the exterior side of the lock. It immediately was stuck, even though it operates the deadbolt just fine. Is my only remedy to remove the lock and take it to a locksmith?..... Seem like the best idea at the moment-unless you can find something loose or disconnected inside (typically the plug retainer) which is usually the cause of your type of situation.